If you're shooting high volumes of ammo at an indoor range, you could very well be at heightened risk of exposure to lead and other heavy metals used in most ammunition. Although other shooters' activities may contribute to this risk, you'll most obviously face the heaviest exposure from your own guns and ammo. 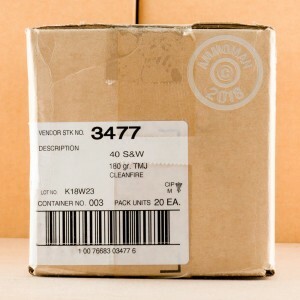 This .40 S&W Blazer Cleanfire ammunition, packaged in boxes of 50, seeks to address toxic exposure risks. Manufactured by CCI, it uses non-toxic primers and 180 grain total metal jacket bullets that completely cover their lead cores. 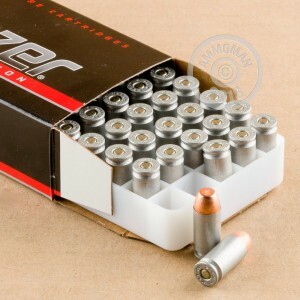 This ammunition, like other Blazer Cleanfire products, uses aluminum cases. Though not reloadable, aluminum cases cycle well in most firearms and have become popular among shooters due to their low cost. 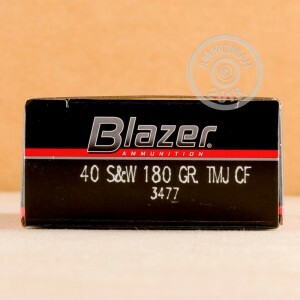 Buy a few boxes of this ammo or any of our other offerings to get your total over $99 and qualify for free shipping. Our shipping policy is a real, tangible benefit that separates AmmoMan.com from the rest!